“This strangely beautiful silent film from D.W. Griffith is also one of his more grim efforts; an indictment of child abuse and the violence of western society.” – So reads the LoveFilm blurb for this 1919 silent picture, and should justify why it took me a little while to get around to watching: it sounds bloody depressing. More so, in fact, than it turned out to be, as the horrendous racism, when seen from a modern perspective, overshadowed the more soul-crushing elements of the plot. Richard Barthelmess, clearly a Caucasian, plays a Chinese Buddhist by squinting his eyes and pursing his lips. After witnessing the uncouth English sailors descending upon the Chinese treaty port where he lives, he sets out to England to teach them the ways of Buddha, in an attempt to bring the message of peace into their lives. Some years later he has all but given up his mission, resorting to owning a trinket shop and dwelling in seedy opium dens, lovingly referred to as a the Yellow man or “Chink store-keeper.” Meanwhile, the orphaned Lucy (Lillian Gish) is regularly abused by her brutish drunkard of a father, Battling Burrows (Donald Crisp). He has no qualms about whipping or beating her for the slightest transgression, be it spilling a drink or being a few minutes late with his dinner, and though she has no reason to whatsoever he forces her to contort her own face into a smile for his amusement. One particular scene sees Burrows relentlessly whipping a prone Lucy as she lies, unmoving on the floor. Lucy longs to escape this life, but her only two options – marriage and working the streets – are fraught with hardships of their own. One day, Lucy manages to escape and flees to the Yellow Man, who takes her in and cares for her, forming a relationship that Burrows doesn’t necessarily approve of. If it weren’t for Mickey Rooney’s portrayal of Mr. Yunioshi in Breakfast at Tiffany’s, this could arguably be heralded as one of the most racist films ever made, not just in the fact that even in times of friendship the Yellow Man is referred to as ‘Chinky’. Also, the use of a white man to play a Chinese would be less obvious, were it not for the fact that Asian actors are used elsewhere within the cast as extras or smaller roles, yet they could not be trusted with the lead, or even the smaller role of a rival Chinese store-keeper, Evil Eye (Edward Peil Sr.). It’s probably all just a product of the time (this was made almost 100 years ago, after all) but I still find it all in very poor taste. I was surprised at the use of colour in such an early work. Various scenes were often tinted with a deep blue or a bright fuchsia, presumably to better illustrate the emotional state of the characters. At times this was a bit jarring – I can handle watching a film in shades of grey or sepia, but royal blue is a new one – but for the most part it added to the feel of the picture. Something else I found distracting was that Battling Burrows, the villain of the piece, occasionally looked identical to Chicken Run‘s Mr. Tweedy, so often some scenes that were supposed to be harrowing or terrifying, particularly near the end when he stalks towards the camera, came off to me as a little hilarious. There were a couple of nice touches – the look of Barthelmess’ face when he encounters a young priest looking to head to China to impart the wisdom of God, thereby mirroring his own hopeless, failed endeavour -and the use of colour in a sea of black and white is noteworthy and effective, but I don’t think I’ll be going back to this. This entry was posted in 05/10, 1001, Choose Life, Review and tagged Arthur Howard, Broken Blossoms, D. W. Griffith, Donald Crisp, Edward Peil Sr., Lillian Gish, Richard Barthelmess by jaycluitt. Bookmark the permalink. 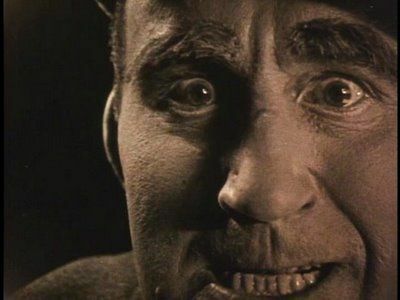 I actually think that D.W. Griffith was trying to make amends for his horrendous "Birth of a Nation" by telling us that people of races "we" look down on are capable of more mercy than ourselves. Sort of the Good Samaritan fable. It is then so ironical that the execution of this "apology" is so clumsy and flawed (using caucasians, calling him a Chink etc.) that we see it entirely opposite of the intention, as a deeply racistic piece.I was fairly positive about this one, mostly because I was seeing a lot of Griffith garbage at the time and by that standard this is gold.Nice review. Interesting viewpoint. I've not seen Birth of a Nation yet, but I've only heard bad things so I'm not really looking forward to it. I'll try and get to it soon to get it out of the way! Jay, I caught up with Broken Blossoms when I went through the first book of Roger Ebert’s Great Movies about five years ago. It was one of my least favorite of the entire group. Along with the racism, it’s also really melodramatic and slow. I just couldn’t get into it at all. I have seen Birth of a Nation and think Griffith is an important filmmaker, but this was a painful experience. It sounds like we’re pretty much on the same page.